Scanner Bag™ is a new and clever travel accessory – a luggage tag with a quick-fold pouch inside to hold your "pocket stuff" when you go through a security checkpoint. 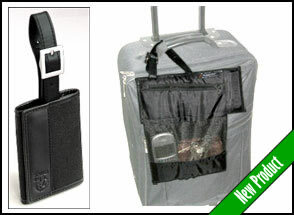 Scanner Bag™ can't make airport security lines shorter, but it can help make it easier and even a bit faster for you. "Clever… You save time… Your items stay together." "Smart... Makes getting through security a little easier." "The new Scanner Bag is pure genius." "Perfect place to tuck a cell phone, iPod, Blackberry, pens, change... when going through airport security." With Scanner Bag™, there is no more scrambling to find the "plastic dish" at the checkpoint entrance or to recover it at the exit. At airport security, you put all of your small valuables into your Scanner Bag™ and it carries them through the scanner machine while attached to your carry-on/briefcase. Better security for you because all of your things stay together. Ever forget your phone or keys at the checkpoint? Not now – they're attached to your bag. There's no more rush at the checkpoint to put all of your pocket stuff back into your pockets. Just grab your carry-on from the scanner belt & go – and put stuff back into your pockets after you get to the gate. Scanner Bag™ folds up quickly. And, because it is also a luggage tag, it has a window to hold a standard-sized business card. Available in 3 styles and prices. Knee Defender™ helps you stop reclining seats on airplanes so your knees won't have to. And with its new design, this clever gadget looks cool, too. travel accessory – a special favorite of tall frequent fliers. Knee Defender™ is also valued by airline passengers with small children, "road warriors" who need to work while flying, and any traveler who simply does not like being hit by a reclining airplane seat. We all like legroom when we fly, but as airlines have reduced legroom the reclining-seat problem has gotten worse – less legroom, more encounters with seatbacks. Knee Defender™ has been featured by 100s of newspapers, magazines, and TV and radio shows around the world – selecting it as an effective and even essential product from the large pool of available travel gadgets. "If the guy won't compromise, whip out your Knee Defender." "As devious as it is ingenious." "Our favorite idea in air travel this year." "These little beauties work! ... Definitely made my time at 36,000 feet more comfortable and more productive." With Knee Defender™ you can now use a simple, convenient, pocket-sized device to help defend against most flying seatbacks. And Knee Defenders™ are adjustable, to help provide only as much protection as you need. Our shopping cart / check-out system has been moving slowly at times due to unexpectedly heavy demand. We ask that you click buttons only once. We apologize for any inconvenience. 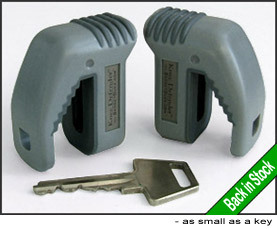 Since 2003, the little travel gadget that could, Knee Defender™, has been helping airline passengers around the world protect themselves and their things. In fact, we have shipped Knee Defenders™ to savvy travelers on all 7 continents – yes, including Antarctica. Our original website name was KneeDefender.com. Then, we developed Scanner Bag™ to help speed people through security checkpoints at airports and at office buildings. At that point, we needed a broader image to sell our products. And so, we created the Gadget Duck™ character and matched that with a new store address, GadgetDuck.com, from which to purvey our gadgets. So, thanks for coming by the new store. You may just find a thing or two to make your life a bit easier.